(MoneyWatch) Elizabeth Cutler and Julie Rice took a leap of faith in 2006 when they opened their first SoulCycle in New York City. At the time, the idea of dedicating a studio to stationary biking was completely foreign, and many people, including members of their own families, doubted the SoulCycle would succeed. But the two enterpreneurs kep at it, divvied up tasks based on their respective strengths and forged ahead with a plan to make working out fun. Today, SoulCycle has 14 locations throughout the country ad plans to open 60 studios around the world by 2015. How are they doing it? 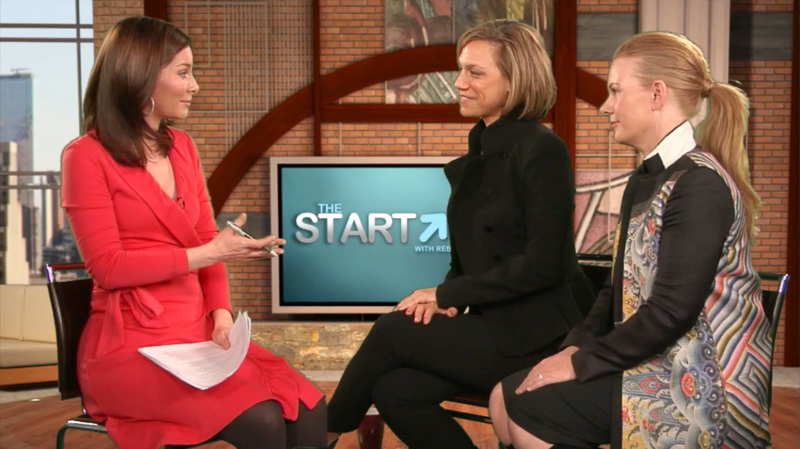 Cutler and Rice joined Rebecca Jarvis on The Startup to discuss their plans. Julie Rice: I am the co-founder and co-CEO of SoulCycle with my partner Elizabeth Cutler. Elizabeth and I met in New York in 2006 and were were determined to find an alternative to the fitness routines that felt like work. Combining inspirational coaching with high-energy music, we designed a workout that benefits the mind and body. In 2006, we opened our first studio on the Upper West Side, and with our partner [gym chain] Equinox, currently own and operate 14 locations nationwide, with plans to open 50 to 60 studios worldwide by 2015. I live in NYC with my husband Spencer and daughters Phoebe and Parker, who continue to inspire me and feed my soul on a daily basis. Elizabeth Cutler: Like Julie, I am the co-founder and co-CEO of SoulCycle with my partner Julie Rice. We founded SoulCycle on the belief that fitness could be inspiring. With a motivational workout, a beautiful environment and outstanding customer service, each 45-minute workout can become a joyful experience. We wanted to make fitness fun. Julie and I are humbled by the response to SoulCycle and are working hard to bring the party to the people. I grew up outside Chicago with two entrepreneurs and in a community where people were conservative but took risks. Then I spent 10 years in Colorado. You can learn a lot about lifestyle in 10 years! Today, I have the most amazing team -- my husband Allen and daughters Nina and Lucy. JR: Before Elizabeth and I started SoulCycle I worked in Hollywood. I was a manger at Handprint Entertainment. I used to scout actors, sign them, and develop film and television careers for them. EC: I grew up in real estate, and I ended up selling luxury real estate out of college. I worked with smart self-starters; plus it was in Telluride, Colo., so my lifestyle was incredible! I became fascinated with the healing arts when I was 16 when my best friend died of cancer. I became a certified Jin Shin Jyutsu healer and had a wonderful practice. When my daughters were born, the practice felt a little too meditative and quiet for me, so I went in search of a more interactive environment. Be careful what you ask for! RJ:How long did it take to turn your idea into a business? JR: Elizabeth and I moved quickly. We were so passionate about our idea that we threw caution to the wind and went for it! We went from idea to doors open in a few months. JR: Because everyone can ride a bike! EC: Because it is the one exercise you can do with your eyes closed. RJ: What's your No. 1 piece of advice to entrepreneurs? JR: Listen to your customers. Take their compliments and complaints seriously. I've learned so much standing behind the front desk at SoulCycle. I really took and continue to take each customer's advice to heart. I quickly learned if one person did not like something, there were usually 50 more people who felt the same way but were to afraid to say anything. EC: Love what you do because you will be doing it all the time. JR: I am lucky. The person I would and always do ask for advice -- on both business and life -- is Elizabeth. I am so lucky to have a partner who is the ying to my yang. We are constantly bouncing ideas and questions off each other. She is not afraid to challenge my ideas, and through endless dialogues she always points me in the right direction. EC: [Nike founder and chairman] Phil Knight -- I would ask about the balance of creativity and scale. Or Jon Stewart. I want to ask him how he is such a genius every single night. JR: Yes, we are growing, growing, growing! Here is my shameless self promotion: If you're interested in working at SoulCycle, please send a letter and resume to career@soul-cycle.com. Tell us about your passion for our product, your work ethic, and your ability to be a team player and to dig in! EC: We are definitely hiring. I could go on and on about this. You get hired at a startup by showing up, working hard and having the "I will do anything" attitude. Then you do it. Execution is key.